Husband, 6-year old stepdaughter and I made the 3 1/2 hour drive one way to see Nibbles over the weekend. I barely slept the night before. I was excited because I hadn’t seen my horse in a month. I was nervous because I haven’t ridden in months. What if she dumped me in front of my husband who, even though we’ve been together for 3 1/2 years, has never seen me ride? When we arrived, Elise met us and pulled Nibbles from her pasture. 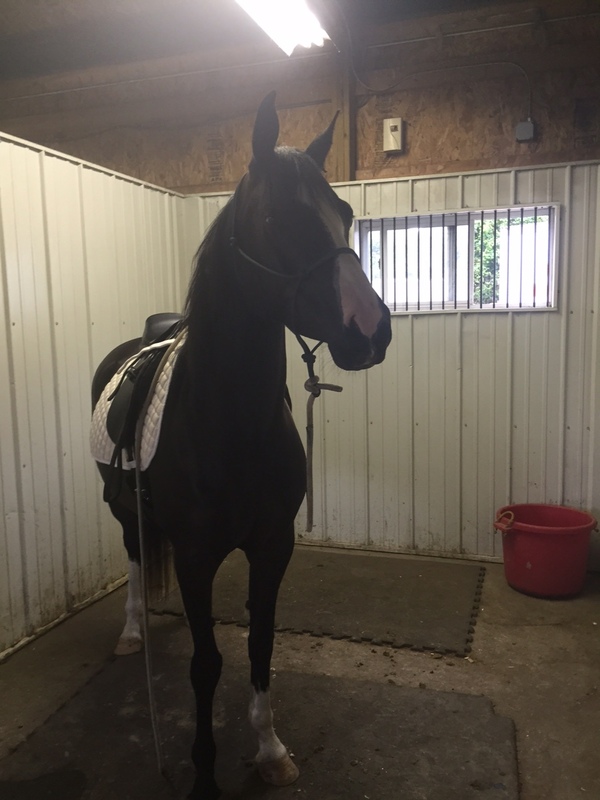 Nibbles’ turnout buddy is Elise’s gelding, a 16.3 hand (I think) Latvian Warmblood named Atlas. He makes Nibbles (15.2) look like a foal. 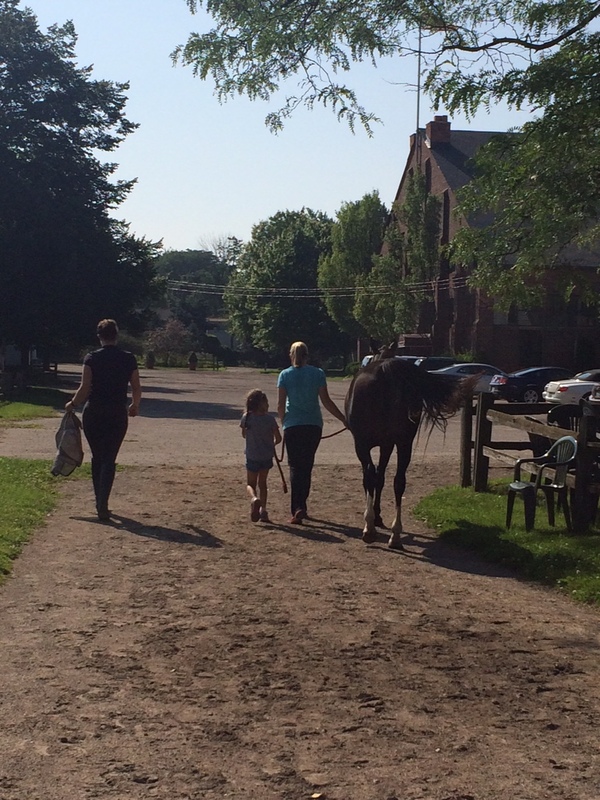 In the crossties, I showed my stepdaughter how to pick out hooves and the proper order of brushes for grooming. Nibbles seemed much more at ease in the barn than last time I visited over a month ago. Elise tacked her up and we headed to the outdoor. I want to do a comparison or progress post based on video so I’m saving the good stuff. If I had to describe Nibbles’ improvement in one word it would be confidence. Watching Elise ride her looks less and less like a wiggly baby and more like a horse who knows her job. Elise put Nibbles’ through her paces on the ground first, showing me some of the lateral work and exercises they’ve been doing to strengthen her hindquarters and get her off the forehand. Then she hopped on and walked, trotted and cantered her around the outdoor and even through some lakes puddles in the arena. She’s still green but Nibbles is most definitely broke. By the photo and video above, you can see what I mean as far as brand new baby versus maybe I kinda got this. By all accounts, Nibbles is progressing by leaps and bounds. I don’t know how else to say it besides I couldn’t be happier. This time, though, I didn’t just watch Super Trainer ride the mare. Photographic proof that I rode my horse. She was also completely fantastic. I walked and trotted her around poles and through flower jumps and she was all, ” I got this mom.” I was grinning like an idiot the whole time. 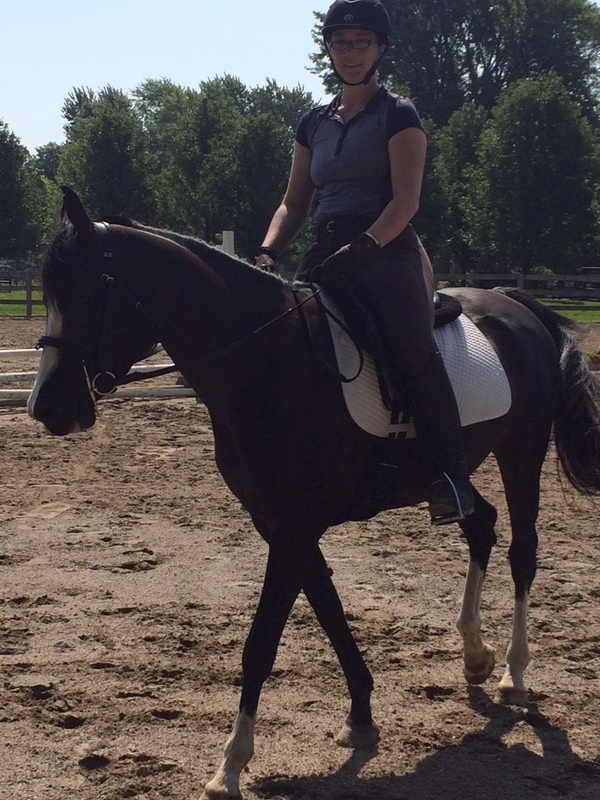 I didn’t canter on account of my own haven’t-been-riding-sloppiness because Nibbles was foot perfect. My husband took a quick video. You can hear Elise ask me how it feels and my response to her if you have your volume on. Note to self: bend your elbows and stop posting so quickly. I did not fall off. I didn’t even feel unstable (even if I look like a sack of potatoes). Nibbles spooked once right after I got on at a bird. It didn’t scare me. I want this more than I’m afraid of it. 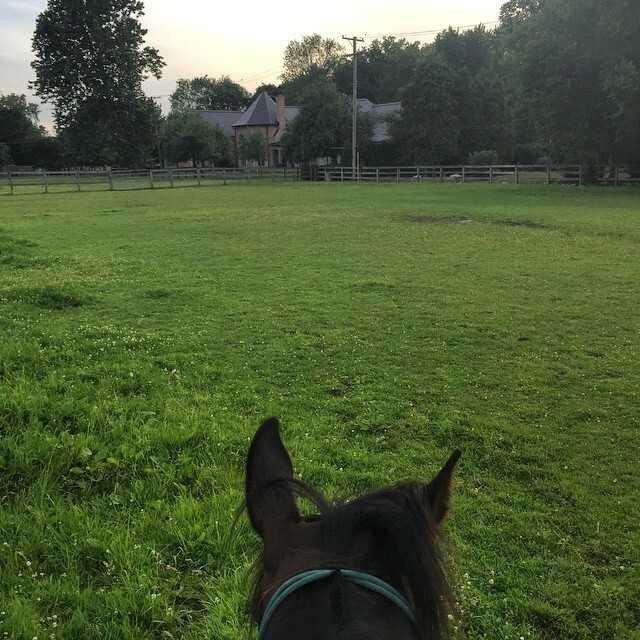 But then came the best part: after a year of promising, my stepdaughter got to take her first ride (rather than just sit on a stationary horse). 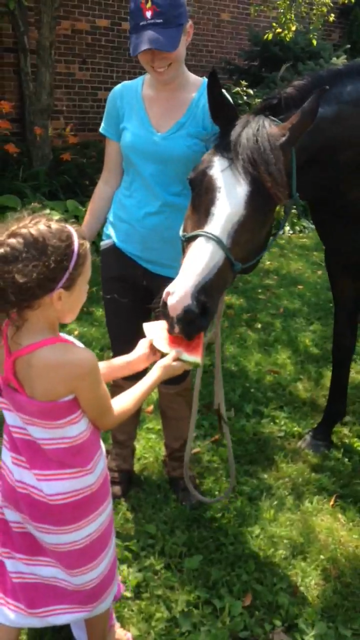 Nibbles LOVED her watermelon. She wolfed down three slices. I get to see my horse this weekend. What better time to snap a photo than when practicing ground tying? Desperation for pony contact has reached new heights. Elise even offered to Facetime my horse for me. In a less desperate move, she sent me photos last night. Look how trim and fit she is looking! My baby pony is growing up and all I can do is make grabby hands until Saturday. I’m a married woman! Trainer Elise posted the photo above on instagram the morning of my wedding. She was the first to make me cry. 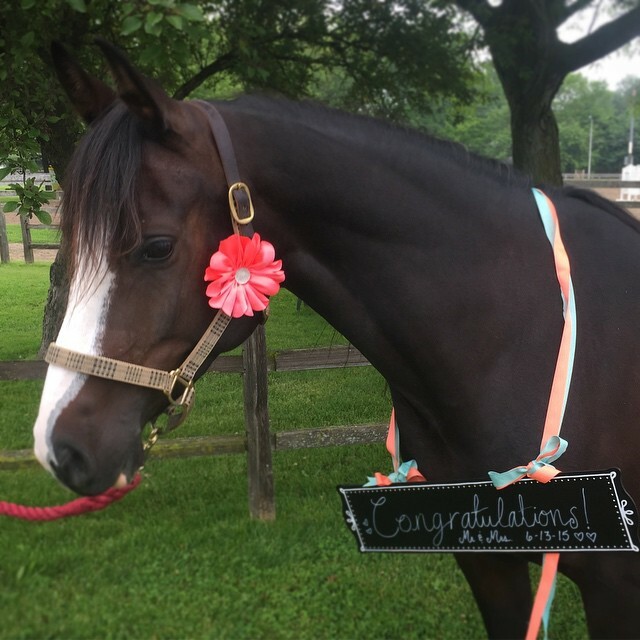 It was the next best thing to having my horse be there for my big day. Everything was beautiful – no wedding photos just yet – then we jetted off to Germany and Austria for almost two weeks. 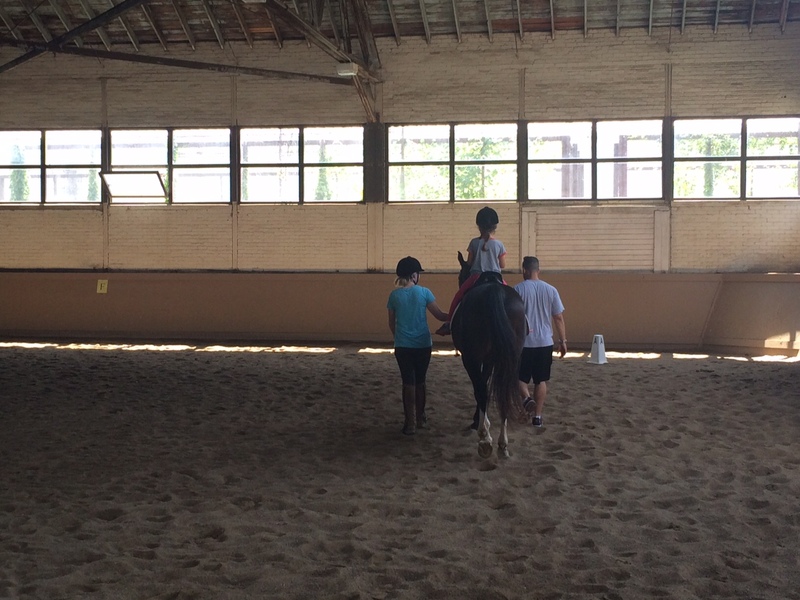 We checked a big item off of my bucket list – the Spanish Riding School. But that day deserves a post all to itself. So while I’m back to reality and back to work, Nibbles remains with her super trainer for the time being. We don’t have a set end date which is perfectly fine with me because my brain is still sizzling from so much change and Nibbles is doing so incredibly well. Nibbles went on her first “trail ride” which was really just a large field. 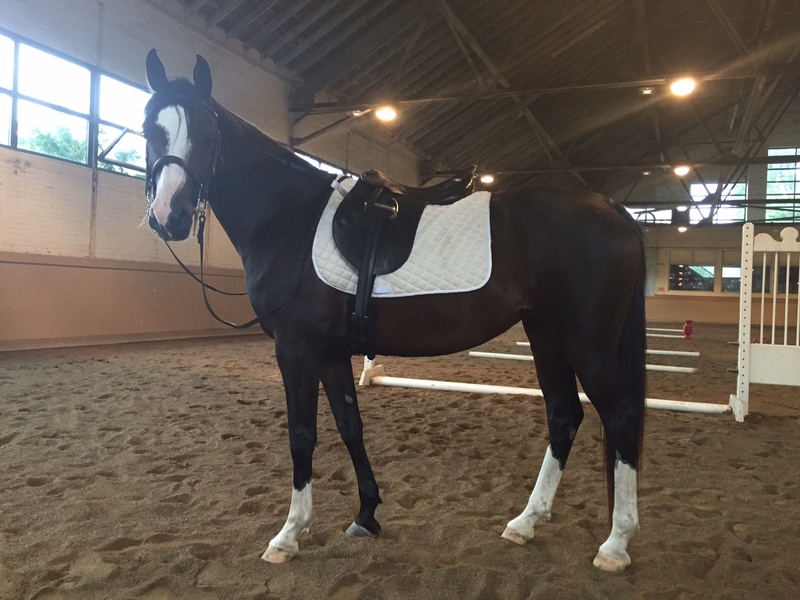 Elise rode her in a halter at walk, trot and canter without any problems. If you ask me, Nibbles much prefers the outdoors and that halter. Hippie horse. 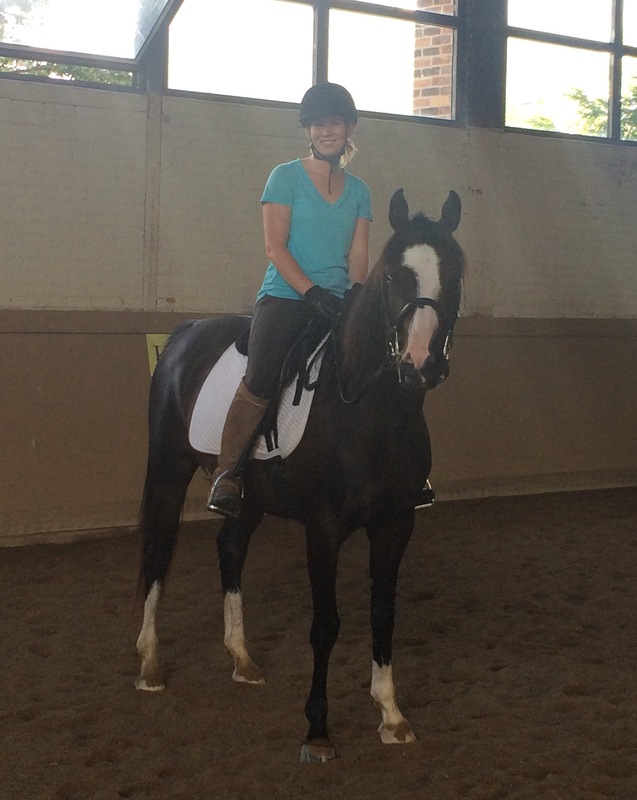 Elise also rode Nibbles with a fabulous clinician in a private session and had a great experience. The clinician liked Nibbles and thought she had a lot of potential. The private lesson started with groundwork, cleaning it up. Nibbles gets a noodly neck to on e direction and gets her nose to close to you when you break over her hindquarters. So they worked on preventing that by reaching up with the leading hand to improve her balance and further engage her hindquarters. She said they worked on waiting a little longer so she can’t rush and that overall the work was light and easy. Next, they did the same thing but in the bridle with a lot of stopping and turning but not bridging the the hind through or fore across like in the halter. 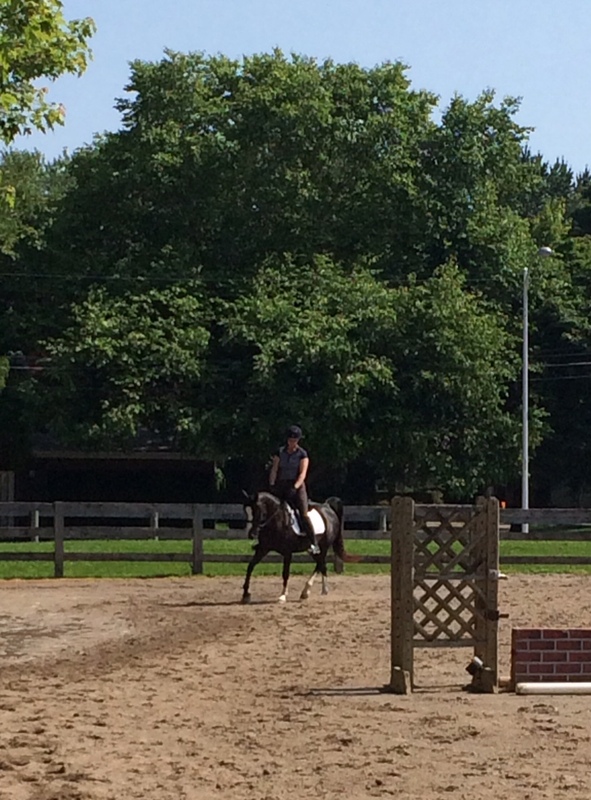 They worked on making her more steady at the mounting block. Elise reports that Nibbles has been okay but hasn’t really improved much. 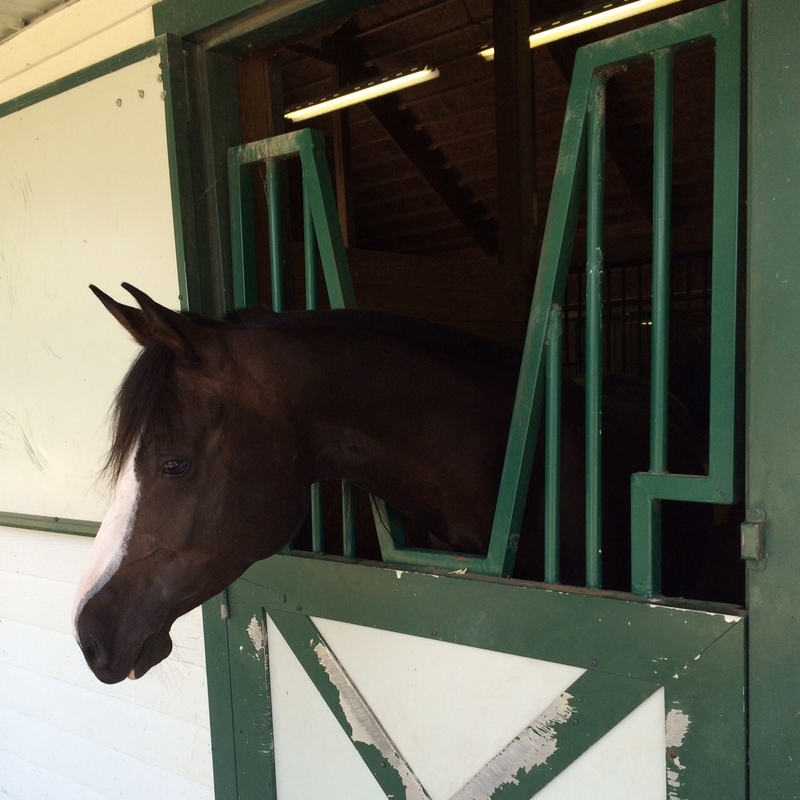 She said she gets anxious when going between the mounting block and wall/fence line. They usually come to the outside or circle it. 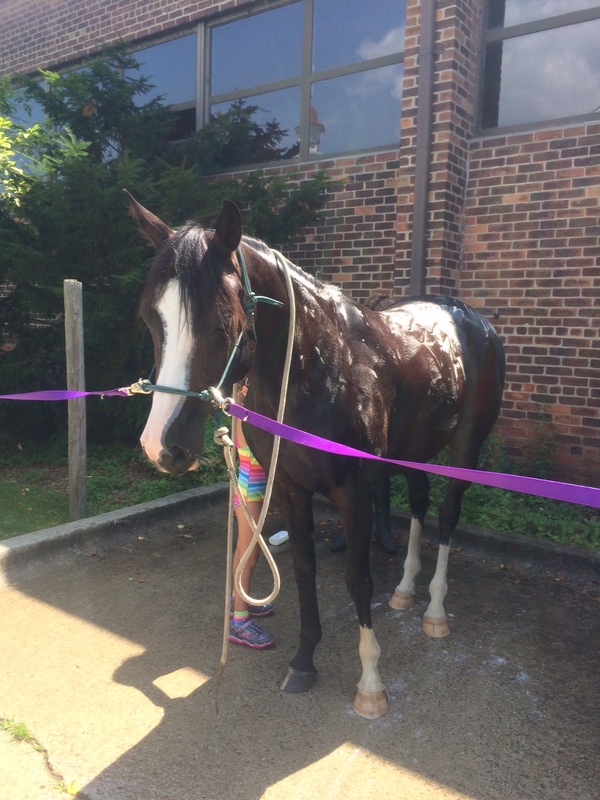 The clinician spotted this, made a few tweaks and in less than 5 minutes, it made a huge difference just by changing how they asked her to walk up to the mounting block. I’m excited to see this in person! 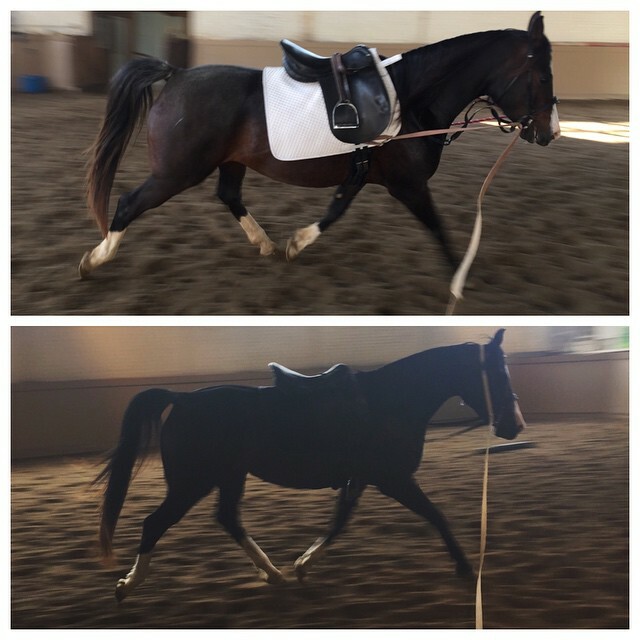 Finally was the under saddle work and really asking for more control of her feet: bringing her hindquarters under just like the groundwork, thinking about asking the forehand to come across, and slowing down/speeding up her feet with just your seat (which Elise says she already does super well). I also can’t wait to see the adjustment they made when she gets wiggly in her head: he had her widen her hands way more than she thought and showed Elise how this made a difference by having her hold the bit in her hands. They also added a slight push of the hands forward through upward transitions to help eliminate head tossing. Basically, I’m dying to see my mare. My husband (!!!!) and I have plans to make the trip to see her next weekend, July 11th.